When Chelsea came up to Orange County, she had a great idea to swap clothes and then return them two weeks later. We always talked about swapping clothes since we have similar taste but the whole distant friendship stopped us from actually swapping. But, it finally happened! Prior to coming over, I asked her how much clothes she was going to bring. She said a bag or a suitcase. I really didn’t think she was going to do that. But, guess what. She wasn’t joking. She came over to my house with a huge suitcase (literally) of clothes! I was quite surprised. She got the chance to look through my closet as I looked through her suitcase. Below is all that I borrowed from her. At the end of our swap, she ended up wearing some of my clothes. From head to toe: beanie that I finally returned to her after 3 or 4 years, yellow and white flannel from Banana Republic that was $20 or less, green anorak from Old Navy for about $30, and off white pants were Chelsea’s from Anthropologie. We told each other that we had to take pictures of our outfits. So Day 1 was on a Sunday and we wanted to dress nicely for church. We both wore dresses from Anthropologie with black tights and a pair of oxfords. By the way, we are huge Anthropology fans. Here are some pictures of us from a week of swapping clothes. The brand of the clothes we wore included: Ann Taylor, Anthropologie, Banana Republic, Costco (Yup, Costco is there), Forever 21, Gap, G-Stage, J-Crew, and Old Navy. Below is our favorite dress from each other’s closet. They’re both from Anthropologie. The one on the left is my favorite of all from Chelsea’s closet. It’s a simple and chic dress perfectly appropriate for the winter season. I wore it a few times with a red belt, black tights, and gray flats. 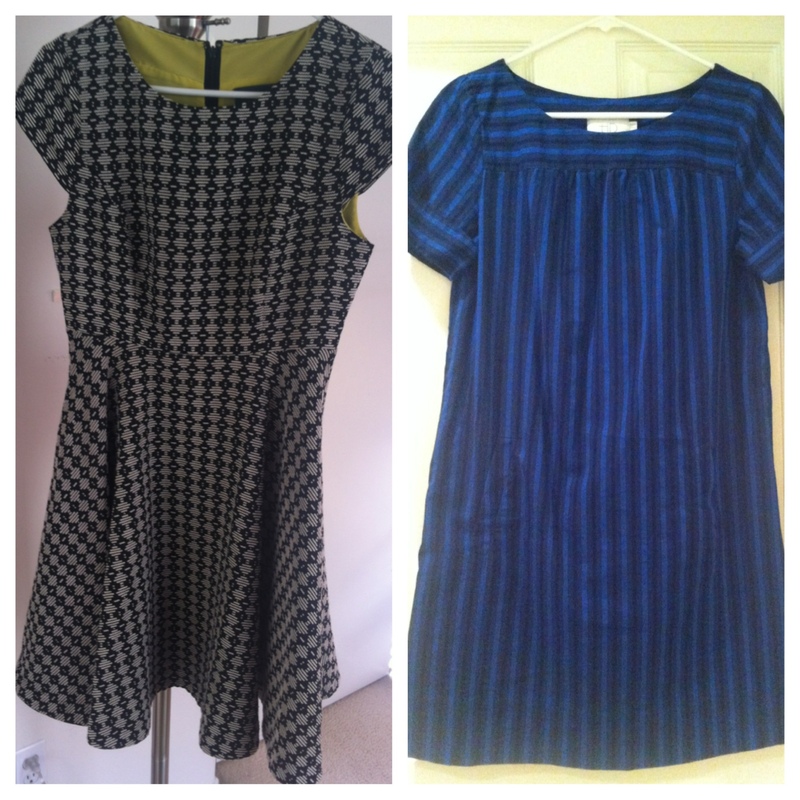 Chelsea’s favorite outfit from my closet was a dress that I call the wise man dress on the right. Without any accessories, the dress looks like something a wise man from the Bible would have worn. To make it more fitting and sophisticated, a brown leather belt with a bow in the center completed the outfit in addition to black tights and either brown flats/oxfords/boots. Can’t wait for spring season to swap clothes again! Chelsea, a bag of spring clothes are waiting for you in my closet as I wait for another suit case to be lugged into my house. ← W + L = Engaged!